Please have a look at these cute guys! 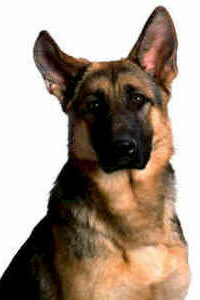 They are traditional german herding dogs, nor GSD's neither cross-breeded with GSD's. I've got no exact idea wich dogs M.v. Stephanitz choosed for creating the GSD, but these dogs look quite similar to it. Though shepherds rarely care for how their dogs look like when breeding and only go for their talents, these dogs are not cross-breeded with any pet dogs. This is why, although their looks differ wideley, they are a very special type of dog that is in high danger of extinction today. I show you these dogs especially because you can see that they're often long hair coated. As well as "The Total German Shepherd", I can see no point in the opinion that a long hair coat could be any disadvantage for a GSD. It protected their ancestors against wind, rain and snow since the early middle ages.